Red Dwarf has arguably been an acquired taste since it first appeared in 1988. A strange, twisted science-fiction comedy, it was everything North American science fiction television wasn’t. Its plots were preposterous, its special effects all appeared to involve flashlights, its sets moved when someone bumped into them and its characters were all clinically insane. It was born to have a cult following. When the ostensibly final season of Red Dwarf ran its closing credits in 1999, its cult following started looking for Prozac the size of a small moon. No one seemed to want to fund further adventures of the errant cast of the mining ship Red Dwarf, and it fell into an alternate universe, never to be heard from again. Red Dwarf Back To Earth is a three-part mini-series in which the original cast – albeit aged a decade – return for an evening. Unlike most such reunions, they’ve lost little of the subtle madness that suffused the original episodes. Due to a slight miscalculation, they find themselves hurled into an alternate universe wherein they’re not themselves, but rather, actors playing themselves on a soon-to-be-canceled television series called Red Dwarf. You might want to read that bit again to make sure you’ve got it completely surrounded. If you didn’t get the joke in the original seven series of Red Dwarf, you’ll find Back to Earth incomprehensible and hugely pointless. It’s clearly a prize for the faithful. Should you own a set of the DVDs of Red Dwarf – or better still, a shelf groaning under the weight of a collection of badly worn VHS videos – you’ll unquestionably want to glue a glitter-encrusted H to your forehead and augment your library with this disc. 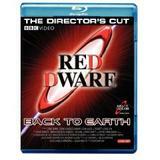 In addition to the original miniseries – available as three discrete episodes and as “the director’s cut,” edited together into a single movie – Back To Earth includes a two-part “making of” documentary, some deleted scenes and a collection of “smeg ups,” several minutes of out-takes and profanity. Rumor has it that the Dave network in the UK which sprung for the production of Red Dwarf Back to Earth was sufficiently tickled by its ratings that a further season of the series is to be forthcoming. You can put your DVD player on red alert now, if you don’t mind changing the bulb.